Tustin, California, November 15, 2016 – Luxion, a leading developer of advanced rendering and lighting technology and maker of KeyShot®, the first real-time ray-tracing and global-illumination program for 3D rendering and animation, today announced new and updated plugins that further integrate KeyShot with Autodesk’s line of 3D modeling applications for the Manufacturing, Architectural and Entertainment industries. Luxion is committed to providing 3D professionals the fastest software for creating 3D product visuals, across the widest array of 3D modeling software, through tools and features that complement their workflow and speed up the product development process. 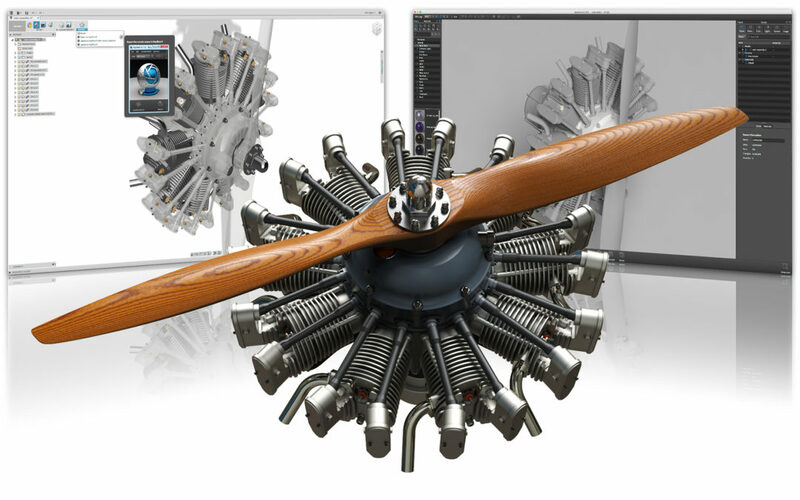 With a long history of support for many Autodesk titles, KeyShot has allowed Designers, Engineers, and 3D Artists to visualize products as they take shape, helping to determine color, finish and materials faster, deliver prototype visuals sooner, provide more engaging product reviews and produce final product shots that completely capture and communicate the function and design. The Fusion 360 integration is just one way KeyShot is making the creation of product visuals more accessible. All KeyShot plugins for Autodesk products are available as a free download from the KeyShot website as well as the Autodesk App Exchange. The plugins can export a KeyShot .bip file without a license of KeyShot installed. For LiveLinking and the other advanced capabilities in each plugin, a license of KeyShot is required. A KeyShot HD license ($995) includes unlimited rendering resolution. A KeyShot Pro license ($1995) includes full KeyShot Animation capabilities. Floating licenses, Network Rendering, and KeyShotVR, for creating interactive visuals, are also available online at keyshot.com, the App Exchange or through a qualified KeyShot reseller. For more information on KeyShot products and technology, please visit keyshot.com and follow Luxion on Facebook or Twitter. Luxion is a leading developer of advanced 3D rendering and lighting technology including applications such as KeyShot and the Velux Daylighting Visualizer. KeyShot is the first real-time ray tracing application that uses a physically correct render engine based on scientific research in global illumination and material appearance. With a focus on making the creation of high-quality visuals from 3D data as simple as taking a photograph, KeyShot is recognized as the standard visualization tool for industrial designers and marketing professionals worldwide. Luxion’s customer list includes many of the Fortune 1000 and major industrial design companies including Chrysler, Fossil, Microsoft, Philips, Specialized, Whirlpool, and IDEO. For more information on KeyShot 3D rendering, animation and KeyShotVR, please visit keyshot.com or follow us on Facebook or Twitter. KeyShot is a registered trademark of Luxion ApS. All other company and product names may be trademarks of their respective owners.